Good morning, everyone. My name is mama&mama. I'm glad to here today. 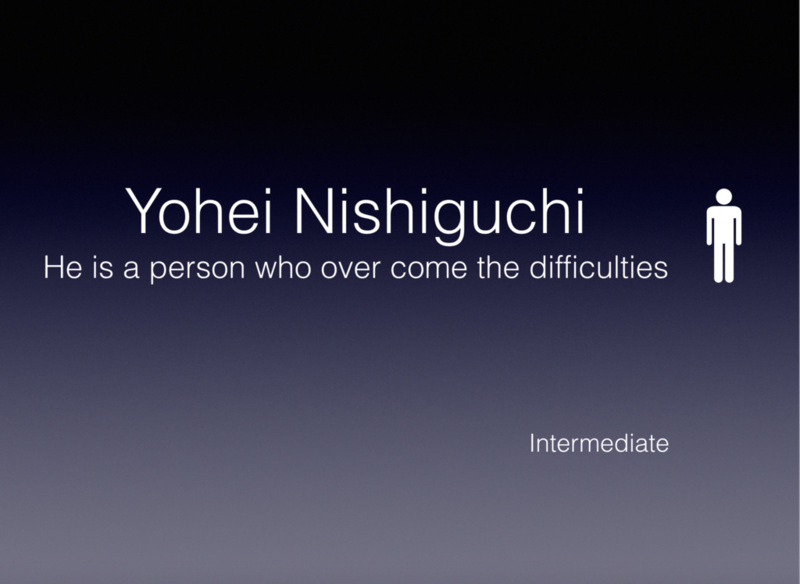 I picked up Yohei Nishiguchi. Do you know him? I know, you don't know. Because he is not famous. He is just my ex-co-worker. I’d like to start by his profile. He was born in Osaka. He played soccer for 15 years! 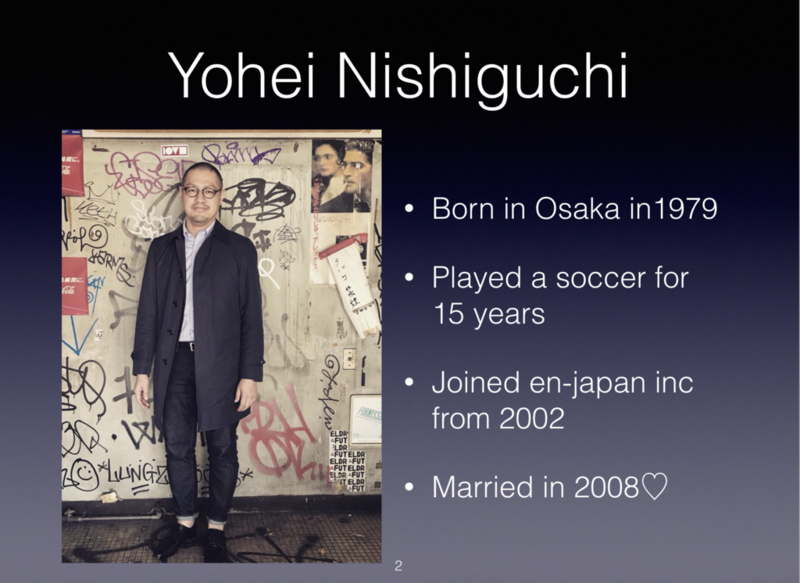 He was leader in soccer club when he was high school and university student. He says “I learned from experience of soccer.” Challenges himself, pushes himself, enjoy each other. He is very interesting and he has warm heart. So many people trust him. He is very general. He is not special. 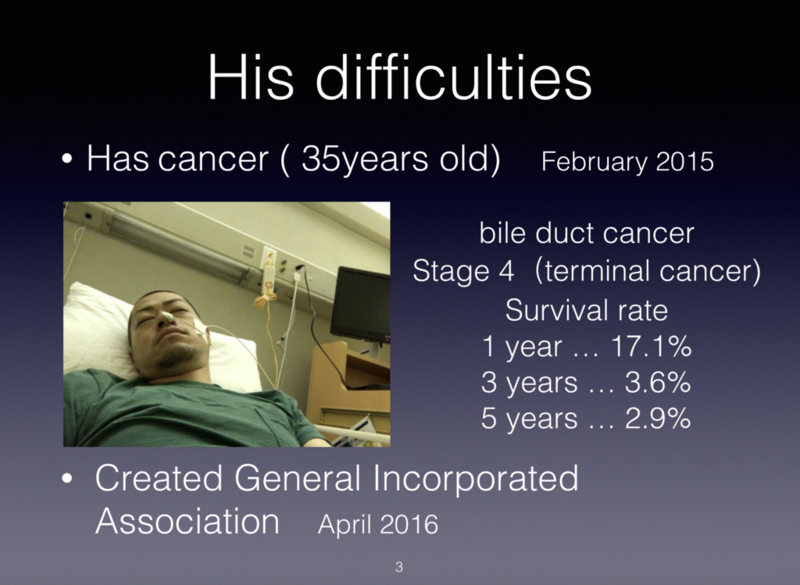 When he was 35 years old, He has bile duct cancer. BILE DUCT CANCER is a rare cancer that forms in the part of the bile duct that is outside the liver. And his doctor couldn’t do operation because he was stage4. His 5 years survival rate is 2.9%. Doctor said it’s very difficult he live 5 years after. But after that, he created a company. 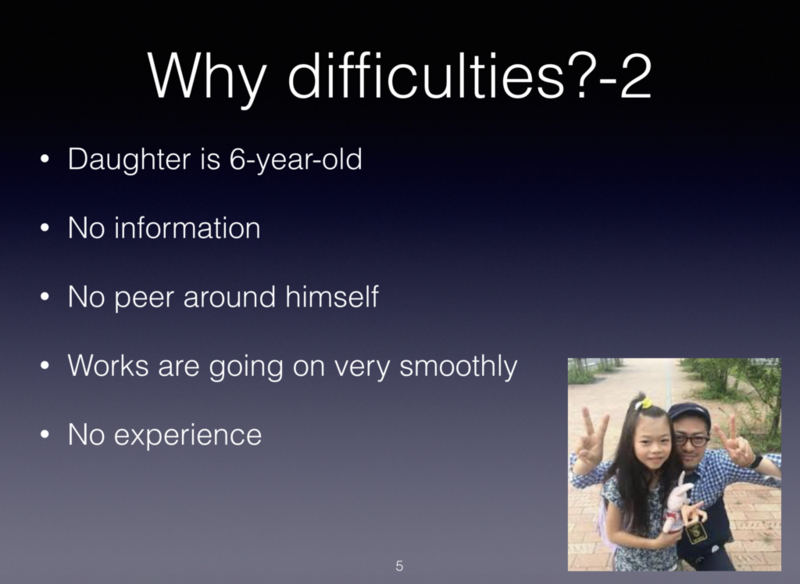 Why these are difficulties? Cancer? Company management? It’s true. But it’s not only but also. In Japan, many people think cancer patients can’t work, because they need to lie down on their bed and they can’t work as before the cancer. They think we have to work a do-or-die attitude! And because their image for terminal cancer is not good. And, He has a daughter who is 6 years old. He thinks in future, if she will worry something, he will not be able to advice. And he is afraid of not being her memory. Next reason is he couldn’t get information. Correctly, he got many informations, but he didn’t know which information was correct. He was very confuse, but he couldn’t talk about cancer, because there was not peer around himself. The other reasons are for created company. One is this. His works going on very smoothly. He was a leader and he had worked for the project for 4years. He had thought he could work for the project more and more! But it was difficult. Last one is this. He had no experience about company management. He was just employee. He had no idea about company management. These are his desire. He wants to make friends, peer. He has many friends, but all of his friends didn’t cancer. He need a peer who is same situation. Because he was loneliness. He wants his wife and daughter to remember him and his works. He was workaholic, so he wants to give expression to his proof. And he wants to be proud of himself. He didn’t want to give up. 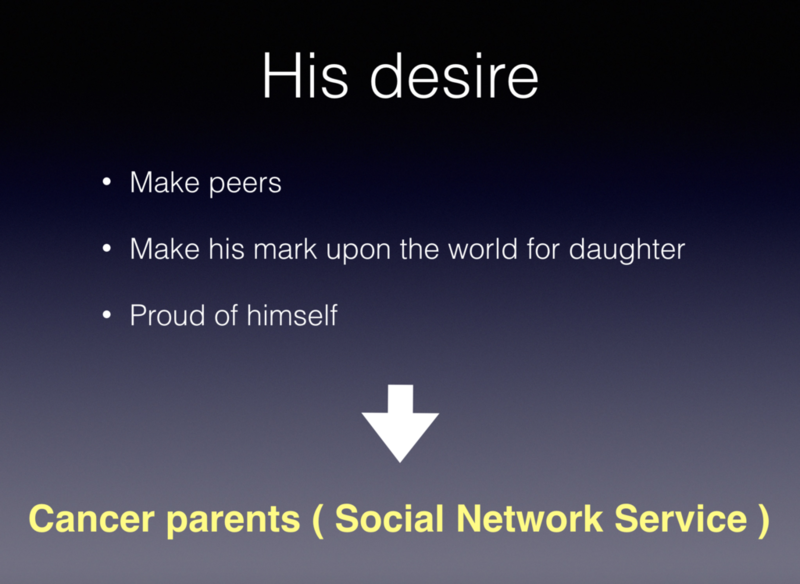 After many thinking, he created CANCER PARENTS. This is a social network service. 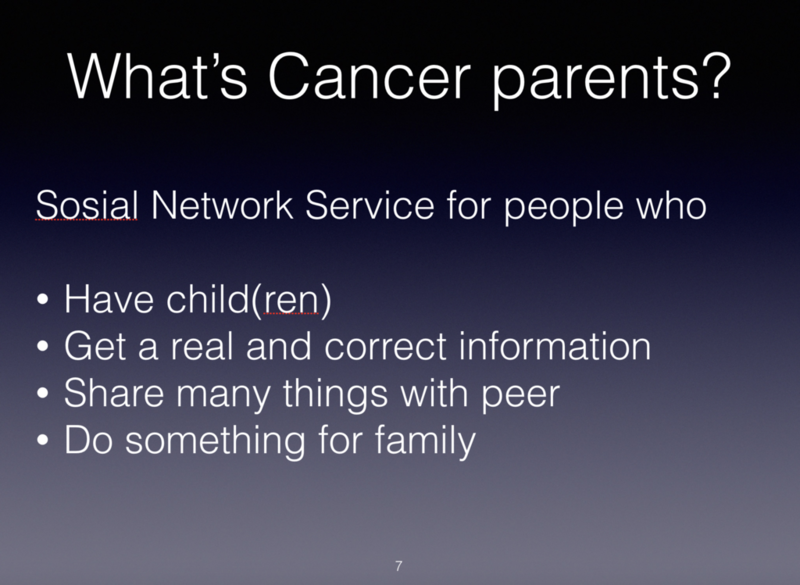 This service is for people have a child or children, want to get a real or correct information, want to talk with peer. For example interesting, delicious foods, anxious feeling. And want to do something for their family. 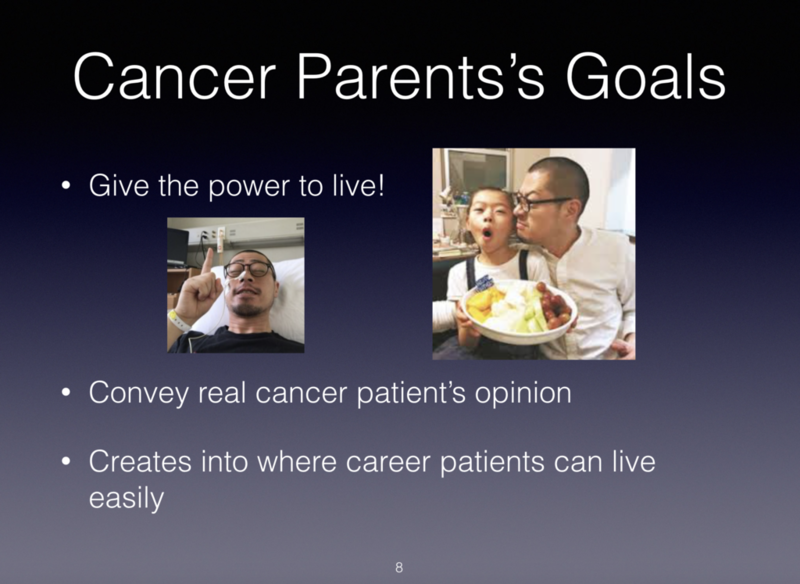 So, Cancer parents's goals are 3. It gives the power to live for patients. 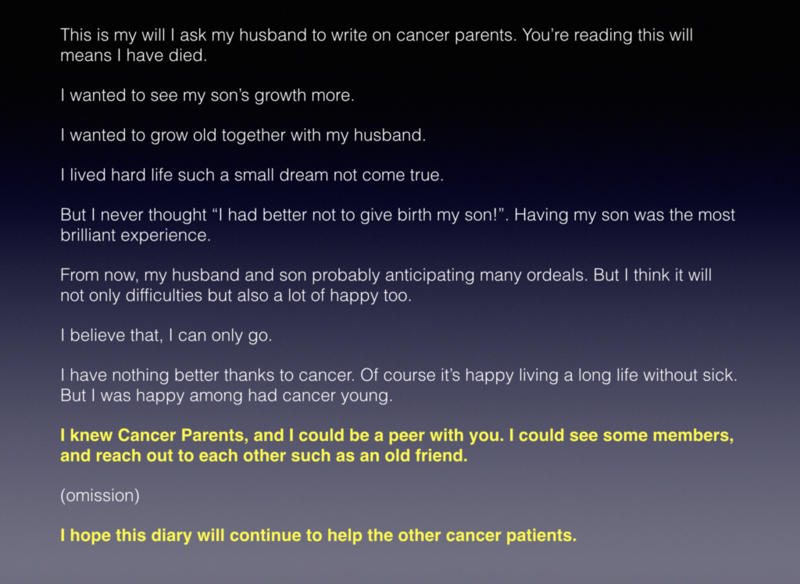 It convey real cancer patient's opinion. It creates into where cancer patients can live easily. He actions for the service, approach for the media. He appear on TV, Radio, Stage, Event. And he thinks to need a structure for continuing his service. I mean, earn money. So, he ask many companies to support. And he creates system cancer patients can work. Of cause, he need to care his cancer. He received 2 types chemotherapy. Chemotherapy means a medician for cancer. But one became ineffective, so now he receives only one chemotherapy. They could release from loneliness, could get many real information,I mean how to chemotherapy, work, take care child, make money, and so on, and made a peer. 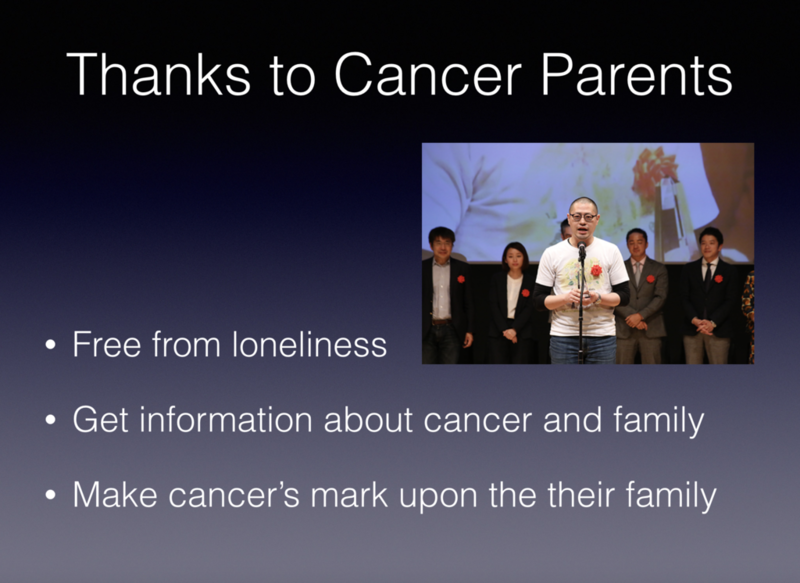 Cancer patients can do something for their family. They could have willingness. 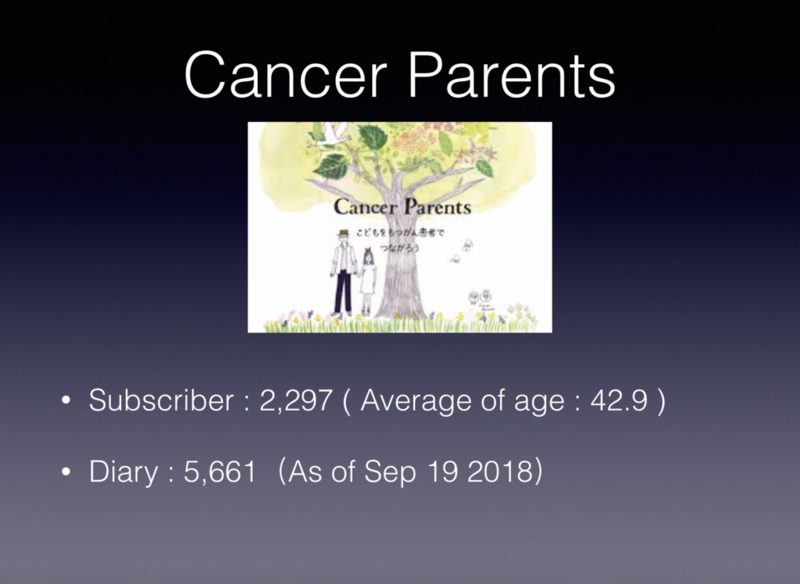 This is a message from member of cancer parents. I think this message means Yohei Nishiguchi’s wish achieved her wish! And it means his action is very valuable. His goals are 2. He wants to say “My life was happy! !” When he die. Leonardo da Vinci said “As a well-spent day brings happy sleep, so life well used brings happy death.” I think he also think so. The other one is this. 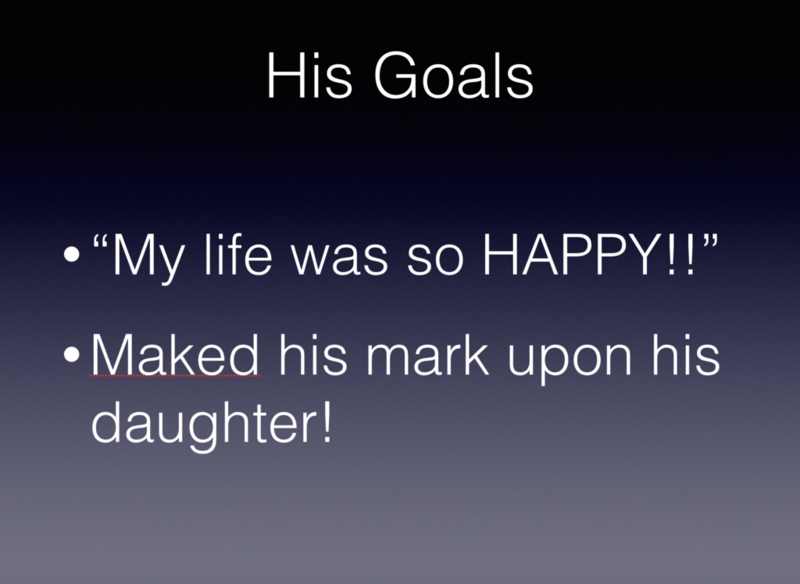 He wants to make his mark upon his daughter. When she remember him in the future, she will be able to do her best. He thinks it’s so happy for him. I think he will challenge until he will not able to challenge. Finaly, I send this message for you and him. 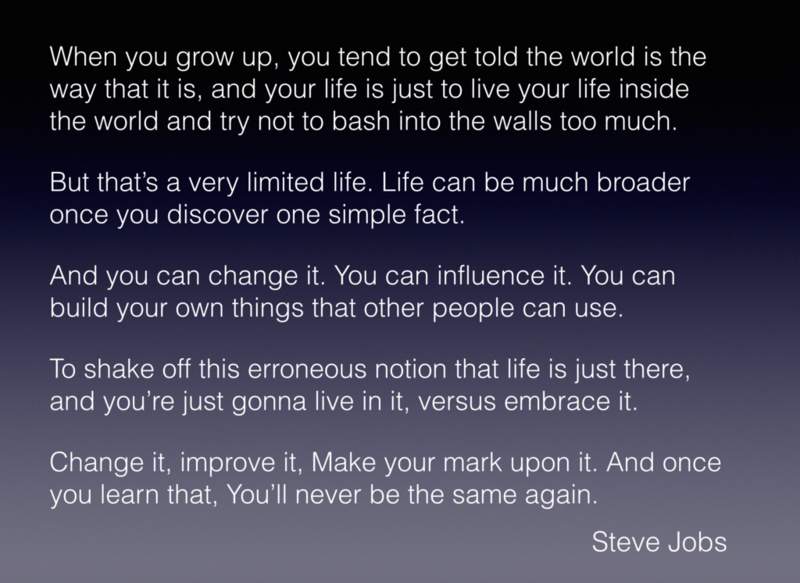 This is Steve Jobs's message. 1)He was cured? Because you said from 2 type Chemotherapy to 1 type. →No, he is not cured. I mean, 1 type chemotherapy was full of him. So, he can't receive. Chemotherapy for bile duct cancer are only two. 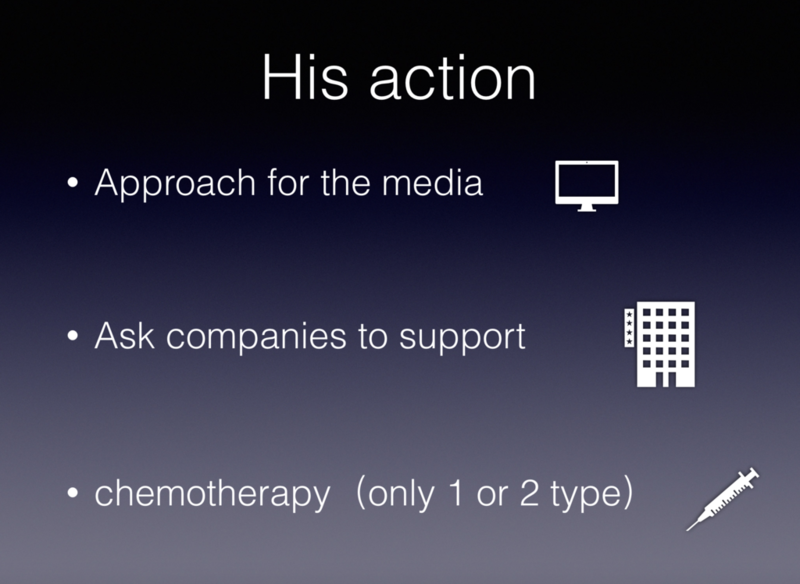 So, he can receive only 1 type chemotherapy. His doctor said "he is working, it is miracle." 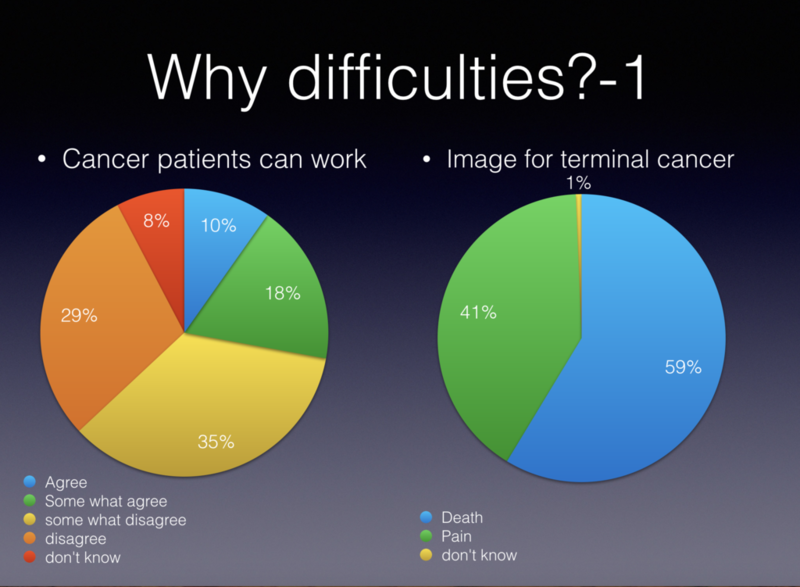 2) Why don't cancer patients work? They still want to work, but? or They don't want? →They want to work, but many company say "I'm so sorry,but...". And if their boss is OK, but co-worker is not OK, many time. I don't know why, but maybe because they don't want to support. Many people think their time is important. In Japan, many people need to be workaholic. Of cause, some company, some people are very helpful.